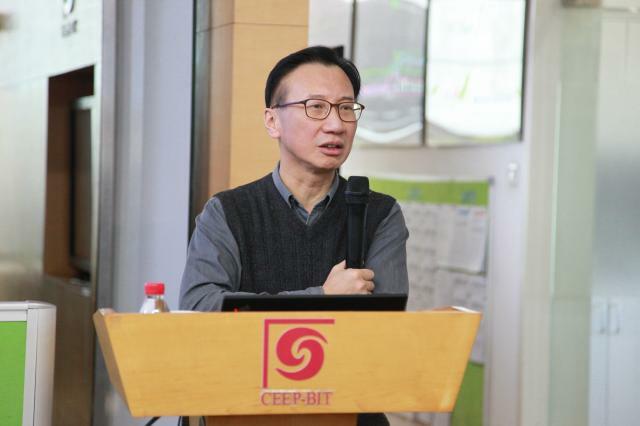 At 10 am on March 25, 2019, Professor Bo Shen, Principal Investigator of Lawrence Berkeley National Laboratory, was invited to visit and do an academic report entitled "California's carbon market experience and reference to China's carbon market construction." The report was presided over by Professor Bao-jun Tang, Associate Dean of the School of Management and Economics. The teachers and students of the Center participated in the report. Professor Bo Shen is the Principal Investigator of the China Energy Research Group of the Environmental Energy Technology Department of the Lawrence Berkeley National Laboratory. He and his colleagues in the lab worked with Chinese partners to develop policies and mechanisms to promote energy efficiency, reduce greenhouse gas emissions, and promote sustainable economic development in various parts of China. Professor Shen graduated from the Department of Mechanics of Peking University and worked in the regional energy planning of the Chinese Academy of Sciences for four years. He studied in the United States in 1990 and has a master's degree in environmental science, a MBA in finance, a doctorate in energy and environmental policy, and a postdoctoral research in distributed renewable energy applications under the auspices of the National Laboratory for Renewable Energy. In today's report, Professor Bo Shen first needs to pay attention to the combination of national conditions when he uses the experience from abroad, and then combines with the California carbon market to implement the current situation, sharing the bill, emission reduction targets and quota allocation. In the specific situation, the final proposal for the construction of China's carbon market. After the lecture, the teachers and students exchanged ideas with Professor Shen on their own interests.